Established in 1775, the United States Navy is [copy-pasting from Wikipedia] “the naval warfare service branch of the United States Armed Forces and one of the seven uniformed services of the United States. The U.S. Navy is the largest and most capable navy in the world, with the highest combined battle fleet tonnage. The U.S. Navy has the world’s largest aircraft carrier fleet, with eleven in service, one in the reserve fleet, and two new carriers under construction. With 322,421 personnel on active duty and 107,577 in the Navy Reserve, the Navy is the third largest of the service branches. 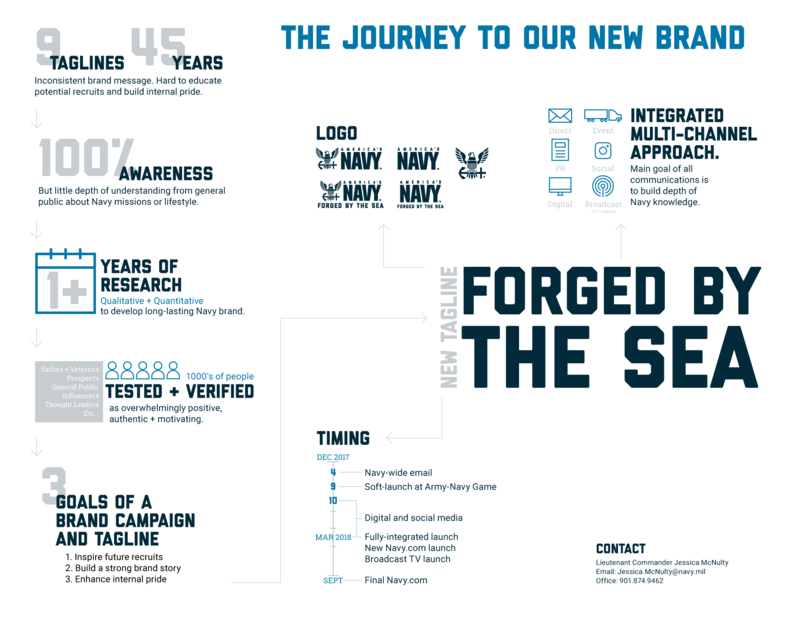 It has 276 deployable combat vessels and more than 3,700 operational aircraft as of June 2017.” Earlier this month, during the Army vs. Navy college football game, the Navy introduced a new tagline, brand platform, and identity by Y&R. Infographic about the brand development. See larger version here. Eagle, before and after. The eagle was previously used in the Navy’s seal and made intermittent appearances on the logo. And, yes, the old eagle was vectorized by dropping a group of caterpillars on a Wacom tablet and letting them figure it out. For the most part, the old logo was only the “AMERICA’S NAVY” wordmark with the eagle from the Navy’s seal making appearances every now and then. The old logo was okay with the chunky, condensed NAVY typography that I guess is resolved as plainly as possible to deal with all its angled letters; the “AMERICA’S” type on top was a little too Macy’s-esque and perhaps not as bellicose as it should be. The new logo keeps the “NAVY” treatment — would have loved to see a new rendition of that from any of a number of accomplished typographers in our industry — and updates “AMERICA’S” with Lost Type’s Liberator, which is a much more gung-ho-ish typeface. The new logo also introduces the eagle as a mainstay and while that is a good strategy, the eagle has to be one of the worst possible executions. Every piece of it — the head, the chest/shield, the wings, the anchor, the feet (my god, the feet) — seems to have each been designed by a different person and none of those persons were allowed to see what the other was doing until they assembled it together. The one nice thing I can say about it is that the proportions are right and possibly that the head of the eagle is cool but everything else is a bit of an embarrassment — especially the eagle’s feet (see below). The inverse version of the logo also shows a big lack of consideration because simply choosing the vectors and filling them with white makes the head of the eagle black and one of the most distinctive features of an eagle is their white head and it should be white at all times. Sloppy footwork. 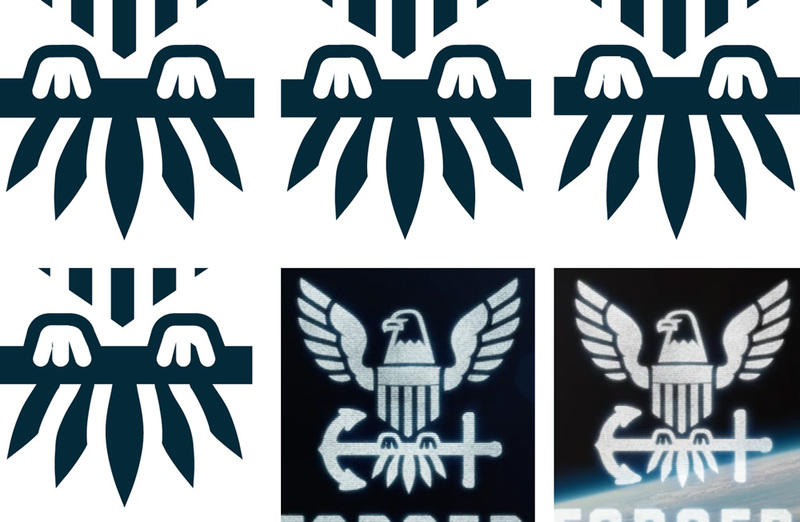 Screenshots of the SVG file used as the main logo on the Navy website, of the infographic PDF (where three different eagles had three different foot vectors), and of the two new brand videos. At first I was going to let go of the feet execution because I thought it was one of those instances where the SVG file gets mangled by the browser but the PDF circulated by the Navy AND the end tags of the videos have the mangled vector feet which is the equivalent in logo design of a surgeon leaving the scalpel inside your body after surgery. Sure, this won’t kill you but, damn, whoever was responsible for the final file delivery should be made to walk the plank. The limited applications shown are decent and show the potential for something cool. The single use of Liberator and the deep blue color, while far from innovative or exciting, is bold and convincing and I think they work so well on the strength of the tagline, which is the best thing about this rebranding. 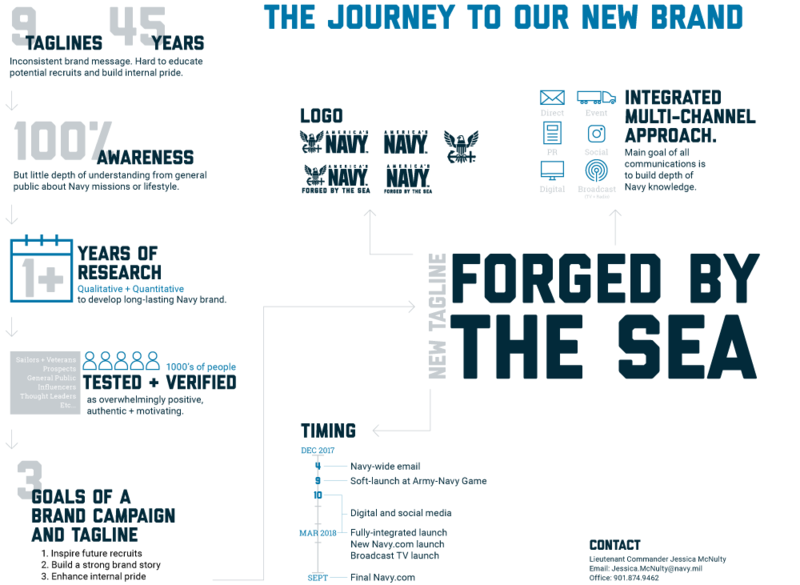 After two years of development, a defined brand platform has been established for America’s Navy. In marketing terms, a brand platform is the central theme or internal “North Star” around which the external messaging is oriented. The core platform of Power to go Beyond and its key idea of harnessing the transformative power of the sea form the foundation of our new messaging. A tagline is the external and outward facing message that conveys the idea of the platform. For the Navy, an effective tagline needed to: originate from Sailors, inform and inspire, be unique to the Navy, and authentically represent the Navy experience. This idea represents the aspirational outcome of every Sailor’s journey in uniform. It conveys the notion that every Sailor is shaped and strengthened into a more capable version of themselves. It also describes the Navy as a team that has been forged, tempered and toughened over 242 years of maritime dominance. Most importantly, it acknowledges the Navy’s unique and fundamental relationship with the sea. I love the use of the word “forged”, because it does convey a sense of being made stronger by something and, in this case, that something being the sea, which is a kind of mythical force. I also like the double meaning of “by”, where the sea is what forges you but you are also forged because you are in the sea. Not sure if that made sense but that’s why I critique logos mostly and not tag lines. Overall, this is a strong way of positioning the Navy — no idea if will appeal to “centennials” (because who the heck knows what they are) — in a simple, bold way. Too bad about the gross eagle. Established in 1775, the United States Navy is [copy-pasting from Wikipedia] \"the naval warfare service branch of the United States Armed Forces and one of the seven uniformed services of the United States. The U.S. Navy is the largest and most capable navy in the world, with the highest combined battle fleet tonnage. The U.S. Navy has the world's largest aircraft carrier fleet, with eleven in service, one in the reserve fleet, and two new carriers under construction. With 322,421 personnel on active duty and 107,577 in the Navy Reserve, the Navy is the third largest of the service branches. 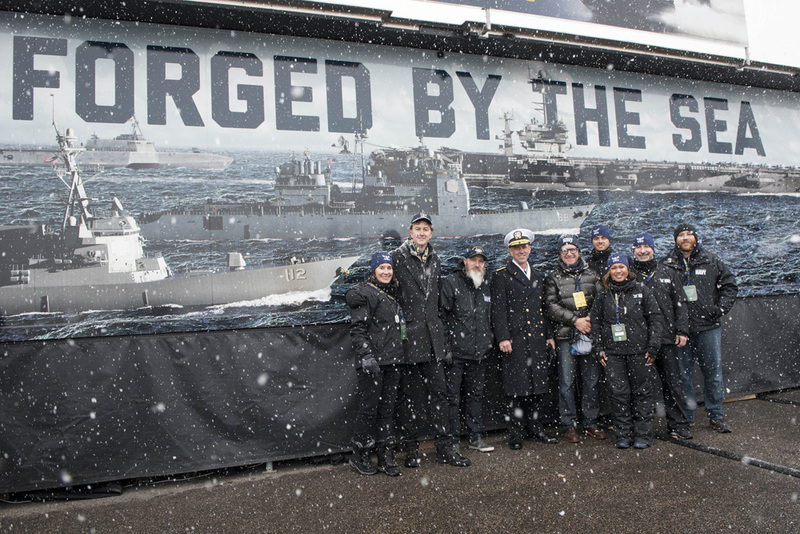 It has 276 deployable combat vessels and more than 3,700 operational aircraft as of June 2017.\" Earlier this month, during the Army vs. Navy college football game, the Navy introduced a new tagline, brand platform, and identity by Y&R.